Ben King joined Moore Ingram Johnson & Steele in 2018 as an associate in the Knoxville office. His practice is primarily devoted to civil litigation, with an emphasis on workers’ compensation insurance defense. Ben was born and raised in Knoxville, Tennessee. He then attended Auburn University for his undergraduate studies, where he received a B.S. in Accounting and a B.S. in Finance. After graduating from Auburn University, Ben earned his J.D. from the University of North Carolina. While in law school, he clerked for the Honorable D. Kelly Thomas, Jr. of the Tennessee Court of Criminal Appeals, as well as a civil litigation law firm in Knoxville, Tennessee. 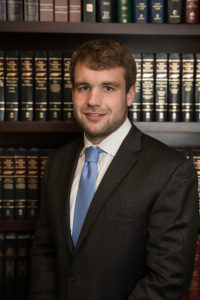 Ben was admitted to practice law in Tennessee and North Carolina in 2018. He is a member of the Knoxville Bar Association. Ben lives in Knoxville with his wife, Kylie, and their three dogs. In his spare time he enjoys running, golf, hiking, traveling, and spending time with friends and family.